I’m taking some time off the next few weeks to spend with my family and our upcoming bundle of joy. In the meantime, I’ve asked a few of my amazingly talented blogger friends to fill in with guest posts. Everyone welcome Julia of The Roasted Root, who, as you well know if you follow her blog (and if you don’t yet, DO IT. Pretty please.) makes a mean… well, everything. Huge thanks to her for making this stellar pizza recipe for us all to drool over! Howdy, GvDers! Julia here from The Roasted Root! Just like you, I adore Stephanie and all of her dough-y (and non-dough-y) creations. I was thrilled when she asked me to pop in for a guest post while she and her husband prepare for their new little one. Can you just not wait to see photos of their bouncing baby girl? Me neither! So. Dough. I figured I’d bring a spring pizza from my neck of the woods to Steph’s since we all know she has stellar pizza dough recipes. Have you tried her No-Knead Pizza Dough or her Beer Pizza Crust? Ohhhh the pizza-bilities! When I bake, I do so sans gluten, but I have yet to come up with my very own neato gluten-free pizza dough recipe. For this reason, I took the easy route with this pizza and used Bob’s Red Mill’s Gluten-Free Pizza Crust Mix. Works like a charm every time! Let’s talk toppings! I’m all about pesto sauce on my pizza, in my scrambled eggs, on my roasted vegetables…anywhere a sauce can go, I pesto. I used a homemade basil pesto for this pizza, but you can use your homemade or store-bought pesto of choice. Since it’s spring and asparagus is in season, I shaved up some asparagus stalks using a vegetable peeler and added shelled edamame and pancetta. PESTO! A heavenly slice of joy. Thanks for having me, fellow dough lovers, and huge congrats to Stephanie! In a small food processor or blender, add all of the ingredients for the pesto sauce except for the oil and blend/pulse quickly until ingredients are roughly chopped. Add the oil (you can do so in a steady stream if using a food processor or add oil all at once if using a blender), and blend until desired consistency is achieved. If desired, add more oil to get a thinner consistency. Set aside until ready to use. Prepare Stephanie’s No-Knead Pizza dough or pizza dough of choice. While the dough is rising, you can prepare the topping ingredients. Lay the pancetta slices on a large baking sheet and bake for 15 to 20 minutes, or until browned but not too crispy. Remove from the oven and allow pancetta to cool. Chop and set aside. In order to peel the asparagus into ribbons, hold firmly by the woody stalk. Using a vegetable peeler (a potato peeler works, too), peel long strands of the asparagus into a bowl. Once the stalk becomes difficult to peel, you can chop what is left and use it too. Repeat for the whole pound of asparagus. Set aside until ready to use. Dust a large baking sheet with cornmeal or flour. Lay the dough on the baking sheet and use your hands to press it into the sheet, forming any shape of pizza you wish (you can also roll out the dough if you have a rolling pin). Bake in the oven for 5 to 7 minutes without ingredients. Remove from the oven and spread 1/3 cup of pesto sauce (or desired amount) over the crust. 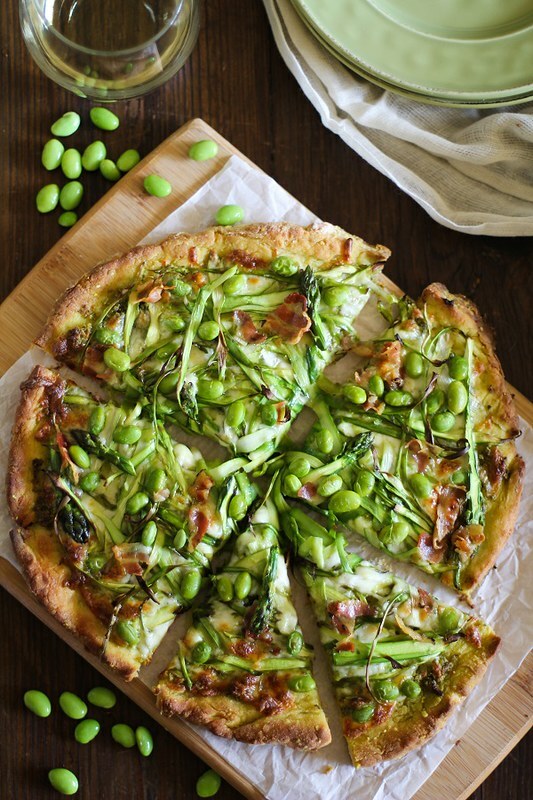 Sprinkle the mozzarella cheese, then add all of the shaved asparagus, edamame, and chopped pancetta. Bake for 20 to 25 minutes until cheese has melted and crust has crisped up. Remove pizza from the oven and allow it to cool about 10 minutes. Serve large slices and enjoy! Note: you will end up with more pesto sauce than you need for the pizza. You can use it for your favorite pastas or use for dipping. Dying for this!!! Enjoy your time off! This is one gorgeous pizza! Enjoy your time off, Stephanie, I can’t wait to see that bundle of joy! Enjoy your time off, girl! So excited for you and your family during this incredibly special time. You ROCK! This pizza is right up my alley, love pesto pizza! Thanks for having me on your beautiful blogsite, m’lady!!! I can only imagine the joy you’ll feel when you get to hold your daughter for the first time. To many, many beautiful memories with the new addition to your family! 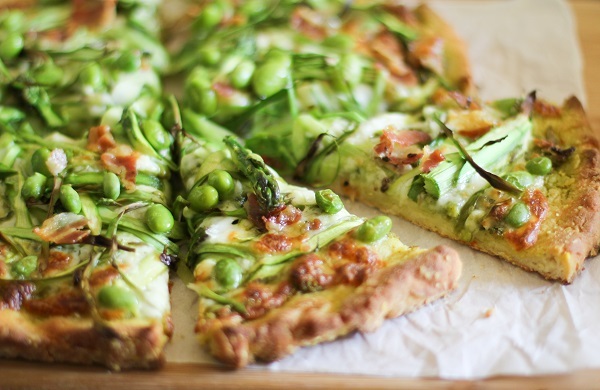 This pizza looks so good, spring on a plate! Hope you are enjoying your time off, but I bet the anticipation is killing you 🙂 This pizza looks amazing, Julia! Enjoy your time away! Such a stunning pizza! Can hardly wait to hear about and see pix of your bundle of JOY! So excited for you. Really! I can hardly wait! Best of luck! I’m so glad you are taking some time off to prepare!! So excited for you! And this pizza looks amazing! 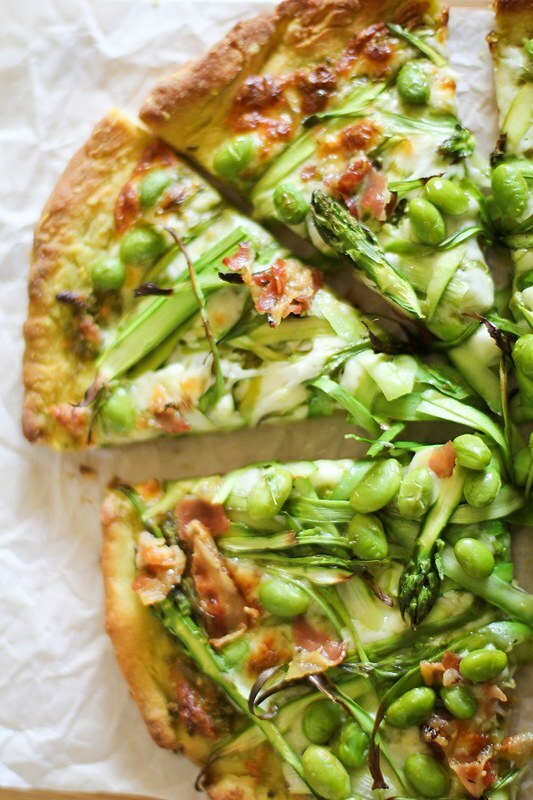 I never knew pizza could look so green and yet so delicious all at the same time! Mmmm Excuse me while I just mosey on over to The Roasted Root to see what else I need to make this week! Julia, this pizza looks amazeballs! When my husband and I did a homemade pizza night last week, I was feeling creatively drained and just plopped plain old pepperoni and mozzarella on mine. Next time, I’m totally going with this! Stephanie, pre-congrats on the baby! So smart to take time off leading up to delivery. I have my blogging calendar scheduled right up to my due date and I’m questioning my sanity. Can’t wait to see pics of your baby girl! Pesto and pancetta on pizza? I love accidental alliterations. 🙂 And also I love pesto pizza, this sounds like an awesome variation. I want this for breakfast. It looks THAT GOOD. This pizza is such a springtime beauty, Steph! I love all those fresh flavors and colors. Great recipe! Great tip with the Bob’s Red Mill gluten-free crust. My sister is gf celiac, so I’ve always wondered if I could whip this up for her. Some of the products we’ve tried have been less-than-delicious. This pizza recipe is amazing and I love a good product review -seriously super helpful! This is gorgeous! It’s Friday night, so I think pizza might need to go on the menu!